THE GOVERNMENT HAS published a survey that claims 96% of PSC holders surveyed were either “very satisfied or fairly satisfied” with the process. The PSC, or Public Services Card, has been mired in problems, with data experts asking why it’s compulsory for certain State interactions and why biometric data needs to be stored on it (Minister Regina Doherty also got into trouble for saying that the card was ‘not compulsory but is mandatory’). 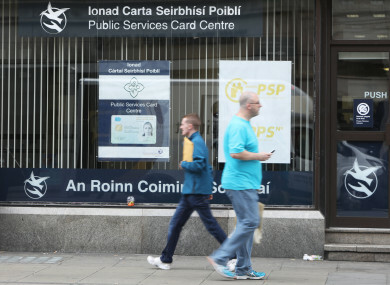 The controversial card was first introduced in 2012 for accessing certain social welfare payments, but has since been expanded as a requirement for other services. These include getting a driving licence and the driver theory test, but the government has since rolled back on that – but has since rolled back on that and announced it would “phase out” the contracts of employees who are involved in the PSC process. Last month, Data Protection Commissioner Helen Dixon extended her investigation into the Public Services Card. Apart from examining the legal basis for processing data, and look at whether the appropriate security measures were taken to safeguard people’s data, the transparency around how data is handled would also be investigated, she said. Today, the Department of Social Protection published the findings of a Customer Survey on the PSC, “undertaken independently” on a representative sample of 1,001 PSC holders who were interviewed in December 2018. The survey found that 87% “agreed that it’s very useful that other government service providers may be able to use the identity information already provided in obtaining the PSC so as to avoid the need to provide the same information again”. More than 8 out of 10 people believe they should have the option to offer their PSC as proof of identity when dealing with a non-government body. Nearly 8 out of 10 people (77%) said that they understood the requirement to retain personal information and do not mind that their documents are retained, according to the survey. Over 3.7 million PSCs have been issued so far. Email “'In-depth' government survey says 96% of people are happy with PSC process”. Feedback on “'In-depth' government survey says 96% of people are happy with PSC process”.